The villas are a collection of beautiful self-contained one, two and three bedroom villas situated in Penestanan Kelod (sth); one of the several villages that make up the area of Ubud. There are also villas for lease and for sale, or we also offer highly experienced villa management services. Left to right: Made Subur and Wayan Sukirta. 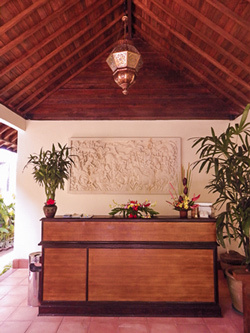 When staying at Lily Lane Villas, Reception is where you can make your transport arrangements to downtown Ubud, or arrange guided tours of the area, tickets to local traditional dances, restaurant bookings, meal deliveries to your villa and an almost endless array of local or distant activities. Downtown Ubud is approx. one and half kilometres. When staying at Lily Lane Villas II, a visit to the Concierge Service Desk provides guests with whatever assistance they need. We provide you with provisions for a daily breakfast of fresh fruit and toast, with condiments; and for easy communication with us, we also supply a local phone. And for even further peace of mind, a security guard patrols our villas each evening. Regarding catering: we can deliver meals or there are plenty of restaurants with home delivery options. Downtown Ubud is approx. one kilometre. Each villa will be serviced daily at a time of your convenience. The Lily Pad, our new lounge and dining area, is now open. It is a large elegant space in a lush tropical setting overlooking our carefully tended food gardens, with the river, our day spa and beautiful rice paddies beyond.